According to CareerCast.com, being a soldier is the most stressful job of 2014. As moms and dads across the country would probably argue, being a parent deserves a spot on that list, too. After all, how many jobs come with an 18-year minimum contract without pay? While we’ve done our due diligence about Stranger Danger and flu vaccines, we’ve missed a big one. Stress is both debilitating and highly contagious, so it makes perfect sense that a generation of stressed-out parents is raising a generation of stressed-out kids. Human brains are equipped with special hardware, wiring that allows us to tap into the emotions we witness around us. The hardware comes in the form of “mirror neurons” that reflect back the emotions we witness around us. Mirror neurons are the reason that our infants smile back at us when we smile at them. That’s a lovely and rewarding example, but these neurons light up in response to all kinds of expressed emotion, not just smiles. The stress that kids “catch” from their parents can have lasting effects on their well-being. For instance, one study showed that when parents are stressed during the first few years of their child’s life, some of the latter’s genes—specifically those involved in brain development and insulin production—can be adversely affected even into adolescence. Furthermore, another study reveals that children of stressed parents tend to eat more fast food, something that further contributes to the nation’s burgeoning child obesity epidemic. Fortunately, getting a massage from Folsom spas and wellness centers like The Healing Station can help parents manage the stress they feel. In fact, research shows that it can lower heart rate and blood pressure levels, while increasing the body’s production of endorphins—otherwise known as the “feel good” hormone. Studies also demonstrate that a 15-minute chair massage can already decrease levels of the stress-causing hormone called cortisol. 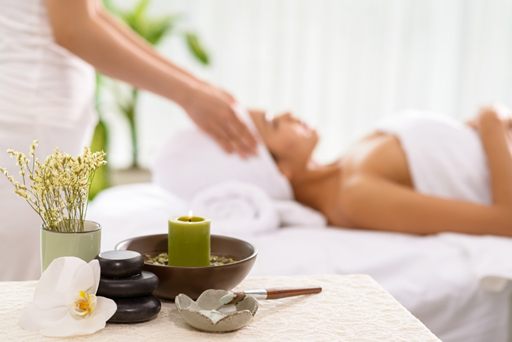 On top of this, a massage session relaxes the muscles, too, providing relief from many muscle aches and pains. Parents devote so much time and effort in rearing their kids that they often forget to care for themselves. To avoid burnout—and to be better parents—they need to unwind every now and then to ease stress. Thankfully, a Folsom, CA massage session provides a well-deserved way to indulge themselves.